I am happy to announce (a day late) that I am moving over to DraysBay and my first piece went up yesterday and I will have another going up today at 1pm. I will still use this site for some smaller pieces, research, and other tidbits but most of my work will be there and my other site MLBdirt. The “power” hitters on the team (Evan Longoria, Manny Ramirez, Dan Johnson, Matt Joyce) are hitting a combined .064/.137/.106 in 47 at-bats. B.J Upton has been on-base 4 time and been caught stealing or thrown out 3 times. Starting pitchers have a combined 5.06 ERA and only one Quality Start. When I learned that Juan Cruz was going to be taking the last spot on the Rays’ roster I was excited. I have always been a fan of his and have always loved his numbers out of the bullpen, which includes an absurd 10.0 strikeouts per 9 innings. In his career, his slider has easily been his best pitch. His wSL is +18.2 and the only other pitch that has been worth more than league average is his change-up thanks to a -6.6 wFB over the past two seasons. Even with age catching up to him and the fact that his BB/9 have always been high there is still reason to believe he can be a solid reliever in the Majors with that slider of his, especially as the 12th pitcher on a roster. The problem is that last year, albeit in a very small sample size, he seemed to ditch his slider in favor of a cutter. He only threw 109 pitches last year but 30.6% were cutters and only 13.9% were sliders. His highest percentage of cutters previous to this was in 2009 when he threw 7.6% cutters and from 2007-2009 he threw his slider 24% of the time or higher. His cutter, again, in limited duty, was worth -2.0 wCT and his slider was worth +0.9 in even less duty. I do not know if this is a growing trend for him but for the Rays’ sake let’s all hope he sticks to the slider. *****As a side note, in the middle of writing this article I was reading Tommy Rancel’s post The Process Versus Mark Reynolds and thought you all may want to read it too because Juan Cruz may be our best option against right-handers with that slider of his. 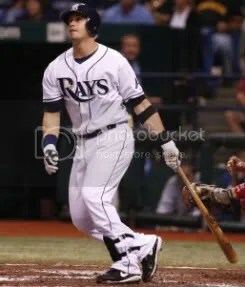 Last in my running posts of position player predictions, and definitely not least, is All-Star and face-of-the-franchise Evan Longoria. In all honesty, Longoria was a little harder to predict than some. Sure, he’s going to be an All-Star again and contend for the AL MVP award, but what made it hard was the fact that he has some trending numbers. In each of his first three seasons in the Majors Longoria has seen an increase in AVG, OBP, and wRC+ which coincided with his increase in BABIP each season and his increase in BB and decrease in K rates each season. The odd part is that his SLG has decreased in each of those three seasons along with his ISO and HR/FB rates even though his FB rate has increased. Very odd that he has had so many stats increase and decrease in each of his only three seasons. What makes it hard is that if you follow the trends you get some weird numbers. Do you buck the trends and change some calculations or go with the trends? I bucked the trends. There is no way they all continue in one direction. But I can see some of them, especially the AVG and OBP going in that same direction. His wOBA in those three seasons has been consistent; ranging from .373-.380 so that is a good sign of his consistent productivity. 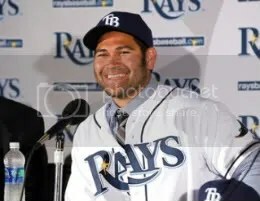 After his worst season since 2001, 37 year old Johnny Damon signed a one-year deal worth a guaranteed $5.25M with another $750K in attendance incentives. A large reason his numbers, especially on the power side, were down was because he posted a career low (since records were taken in 2002) HR/FB rate of 4.8%, almost half his career mark. That could be fluke or sign of age catching up to him. I think it’s somewhere in-between. Not exactly the numbers I want from my starting leftfielder but still not bad. That should be good, depending on how much time he spends at DH, for 1.5-2.0 fWAR. Damon also brings with him a certain style and relaxed flow that should be good for the clubhouse, and yes, the fans. Yes, I know intangibles are mocked in the stat world I live in but I do believe there are some that are legit and Damon possesses some. Are they worth a ton? No, but they do help. Damon should easily pay for his own contract with his numbers and then some but don’t look for a return to his 2009 form. Be sure to check my full top 175 prospect list over at MLBdirt.com. And for those wondering, Tim Beckham did not make my top 300. I won’t bore you with a long post about how Ben Zobrist will bounce back because quite frankly I already wrote it. My gut had him in the .270/.380/.470 range with the article I wrote about him bouncing back and the projections are a little short but not too far off. 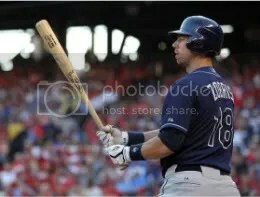 Zobrist bouncing back is a key component to the Rays’ 2011 success and my money is on him doing so and possibly eclipsing the above projections. Why Not Leadoff With Manny Ramirez?